When we hear the word, probably what first comes to mind are the chivalrous English Knights of olde. We envision those stalwart men in their shining silver armor who defended the honor of their ladies at the end of a massive broadsword or jousting lance. Countless movies have permanently etched this image in our minds, and in this case Hollywood got it right for the most part. Or maybe the word “duel” instills visions of pistol armed men standing back-to-back before pacing apart or the wild west outlaws eyeballing one another across a dusty expanse. Whichever image springs to mind, dueling, as a practice, has an ancient history and is steeped in tradition. Over time dueling became an honorable activity with rules and regulations so iron clad that it would take numerous laws and many centuries to finally halt the practice. Physical confrontations of all varieties are as old as time, of course, and may or may not have involved rules or used weapons. A duel, on the other hand, always included swords and an organized format. 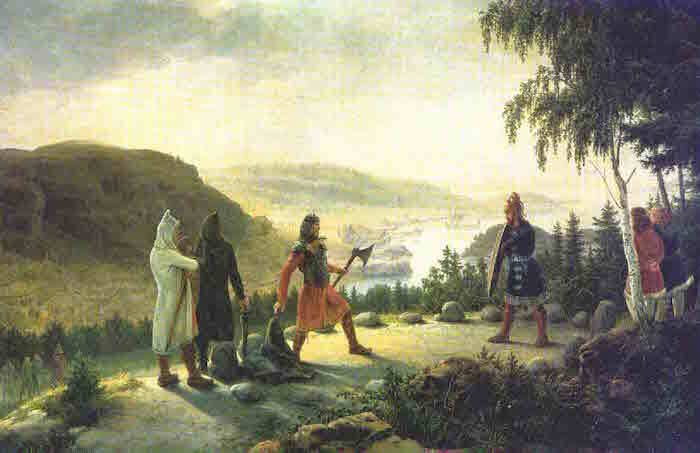 The first of these was the judicial duel, which arose as far back as the 5th century in western cultures – Norse, Swedish, Irish, Germanic, and English. Dueling during these ancient times was rarely condemned and was actually looked upon as a respectable method of settling a conflict. It was a civilized, honorable way of handling a quarrel with an impartial judge overseeing. Furthermore, the victor’s reputation increased as it was considered a sign from God that the cause was just. 1409 judicial combat in Augsburg between Marshal Wilhelm von Dornsberg and Theodor Haschenacker. The duel of chivalry evolved from the judicial duel, and co-existed with it for several hundred years. Scholars generally agree that knighthood originated in the 10th century, and duels of chivalry date from that time. These were events of great ceremony: two knights on horseback with lances engaged in combat to decide questions of law, property, or honor. The duel of chivalry is distinguished from the tournament, which was a demonstration of a knight’s skill and intended as a form of entertainment. Tournaments, however, could be as bloody as a duel. In fact, the church was opposed to tournaments due to the mortality rate of the participants, and the Council of Reims of 1148 prohibited Christian burial for the casualties of such events. The term “throwing down the gauntlet” originated when a knight would respond to a perceived or real slight to his honor by throwing his heavily armored glove onto the ground at the feet of his offender. The gesture was according to the recognized rules in issuing a challenge to duel, and if the gauntlet was picked up, as stipulated within those rules, it signified acceptance of the challenge. Game on! The term “pick up the gauntlet” originated from this standardized procedure as well. Duels of chivalry faded around the middle of the 16th century, giving way to the duel of honor – the type seen in the Regency – which lingered into the 20th century in France, Germany, and the US. The duel of honor originated in an era where courtesy and respect between individuals were of supreme moment. An insult to another’s integrity, courage, or to the honor of his lady, could provoke a challenge. Failing a formal, public apology, the potential combatants proceeded to the duel. Typically fought between noblemen, duelists were required to be of equal social status as it was considered improper for persons of differing ranks to fight in a duel. The code duello, or dueling code, provided rules for engaging and conducting duels of honor. It was drafted to ensure order, fairness, and opportunity for the duel to be averted in honorable fashion. The earliest known published code duello was the Renaissance-era Italian Flos Duellatorum in Armis of Fiore dei Liberi (circa 1410). The image to the left is a French translation from 1583. The code duello included a list of ethics based on long established Germanic laws. Italy is credited with creating the standardized code for dueling, and can also rightly be esteemed as the birthplace of the duel as an art-form and craft, with dozens of Italian sword masters perfecting techniques that to this day are revered among fencers. Remember the great scene in The Princess Bride where the Man in Black and Inigo Montoya engage in a highly civilized duel, during which they rather casually discuss techniques and name masters of the art? Inigo: Naturally, you must suspect me to attack with Capo Ferro? The Italians perfected the art, no argument. However, most famous dueling code, particularly to English-speaking countries, was the Irish Code Duello, or “the 26 commandments,” written and published in 1777. Gentlemen delegates needed the code to legally regulate affairs of honor conducted outside the law. To avoid claims of ignorance of the rules, gentlemen were required to keep a copy on their person or in their pistol cases. This code contemplated the use of pistols but also provided for swords. American duelists relied either on the Irish Code Duello or the American version authored in 1838 by lawyer, duelist, and former Governor John Lyde Wilson of South Carolina, one of the foremost dueling states in the Union. Despite the history of honor and rules, not everyone looked upon dueling as respectable, favor for the practice vacillated, and the combatants didn’t always follow the rules. On a practical level, one must ask how sensible it is to put oneself in the path of maiming or possible death just because one’s honor was offended! The answer lies in those ancient, medieval codes that believed in the justice of God. But even beyond that was the idea that performing bravely in the face of a challenge and defending what was honorable in a manly way was worth the chance. Real men did not back down! Tragically, many of those real, brave men were killed even though dueling typically wasn’t intended to be a fight to the death. Many of the laws forbidding dueling came about for the simple purpose of protecting and saving the upper class from extinction.The loss of life due to dueling was significant. At one point in Spanish history less that 25% of noble males lived to see their 20th birthday! During some thirty years of the 17th century it was noted that enough French males of rank had died from dueling to make up an entire army. These statistics may be exaggerated, but it was a serious enough problem to warrant concern. Not surprisingly, the Catholic and Anglican Churches led the charge to ban dueling and punish those involved. Obviously this did not entirely stop the practice, but it did lower the incidence. The power and influence the Churches wielded among European monarchs waxed and waned over the decades and centuries with a correlating rise and decline in duels. Reigning monarchs passed dozens of anti-dueling edicts, but those monarchs almost universally were lax in enforcing the laws. A rare exception was Queen Victoria who, in the 1840s, ordered the military to rigorously apprehend duelists. Regardless of the laws or enforcement, angry men found a way to circumvent. Duelists who could no longer call upon the law to approve of the combat would “accidentally” encounter each other in some remote locale. This need for stealth necessitated the use of lighter weapons, such as the smallsword and eventually pistols. A dead body was much harder to hide from authorities than a wound, leading to less recklessness and intended “duels to the death.” From this we now have the phrase “fight to first blood.” What is certain is that laws, over all, had scant impact on the decline in dueling. Yes, even Queen Victoria’s proactive endeavors and punishment can’t be linked directly. Rather, the practice seems to have faded naturally in the 19th century as an unreliable form of justice, until utterly disappearing in the 20th century, replaced with derivative games like fencing. As for the broader Georgian and narrow Regency periods, there are few definitive references as to where the practice of dueling was legal or how stringently enforced. Some places seemed to indicate that it was horribly passé while others show the popularity of the practice. Certainly it was quite common in the Americas. Andrew Jackson is said to have fought in 14 duels, including the famous one where he lost his arm. Gun manufacturers apparently did not get the anti-dueling memo as the demand for fancy dueling pistols was ever on the rise. Every English gentleman owned a custom designed set, evidence of his prestige and a visible badge of his honor. The habit of wearing a sword at one’s hip was no longer fashionable, thus the natural evolution to dueling with pistols taking precedence. Although it is clear from what I read that pistol duels were the norm by the late 1700s, swords were also still used. Getting back to my debut novel, Mr. and Mrs. Fitzwilliam Darcy, one may ask, Why write in a duel when it was a waning practice? Primarily I simply love watching and reading about sword fights! When I thought of exciting, interesting, dramatic moments to enhance my novel, a sword fight popped into my mind. Also, I thrilled at the challenge of writing a realistic sword duel. I researched the practice, and decided that since there was some debate on the subject, I could have Darcy partake in a duel without going too far into left field. To be honest, the practical side of me agrees that fighting in such tests of honor is utterly moronic, and therefore probably not something a sensible man like Mr. Darcy would do. Still, it is rather romantic! Come on, we gals all want to believe our man would battle to the death for us, right? ← How Time Flies! My Mind is Still in Disney World…. Very interesting post, Lady Sharon. The poet Byron’s great uncle was convicted of causing a death in a duel and escaped by benefit of clergy. Several politicians duelled without any legal consequences though the newspapers spoke out against the practice. A couple of men were hanged for killing a man in a duel as that death came under the law under homicide. . Around 1819 a young man challenged the man he accused of causing his sister’s death to a duel to determine whether or not he was guilty of the offense– a jury had acquitted him for lack of sufficient evidence. Because the young man was underage, the accused refused to fight and parliament hurried to repeal the law as to conviction by battle ( I can’t remember the correct phrase) . There appears to have been an English code, an American code, a French code, and irish code and the German code. The German appears to have lasted the longest. It also appears to have required one man slashing the cheek of his opponent. Duels should have been abandoned along with the idea that God determined the outcome back before the middle ages ended. The duel in Austen’s Sense and Sensibility is often overlooked. It came out more clearly in the movie but it is definitely in the book. It also shows how stupid it was. Brandon faced being killed for no reason and the outcome didn’t improve the lot of Eliza’s daughter or her infant. It does show Brandon as a real romantic but it wasn’t even helpful there unless someone told marianne about it. Brandon either wasn’t trying or had a poor gun or thought killing Willoughby would turn Marianne against him– surely, otherwise, an army officer would be a better shot. Thanks for all the info, Nancy. As always, you never cease to amaze me! Glad you brought up the duel in S&S. I agree that the concept is rather stupid. Of course, when dueling with swords, it is perhaps a bit easier to avoid a death blow. Depends on the persons involved, of course, but from what I gathered, dueling to the death wasn’t usually the goal. With pistols it is tricky, and I think that is one reason why the whole pacing far apart rule was established. Early pistols weren’t all that accurate, improving the odds of injury rather than fatality, at least from the shot itself. Taking into account less than spectacular medical care is a whole ‘nother topic! LOL!